Chris Clemons burst onto the national stage last year. He proved he belongs there this year. There’s a moment very early on in his post-workout interview with several members of the Denver media when Chris Clemons — who’s in Colorado to show his skills to scouts and coaches for the NBA’s Nuggets — can’t hold back his grin. Answering generic questions about his potential as a professional, how his workout went and what he needs to do to get NBA-ready, Clemons holds the smile through the entirety of his 2-minute, 26-second mini-press conference. Five months later, Clemons reflects on that workout and those few moments he “held court” with a dozen journalists hanging on his every word. He recalls his moment in the mile-high spotlight on the eve of the Fighting Camels’ men’s basketball 2017-2018 season opener against Penn State — wearing his familiar Campbell orange and black and not the Denver powder blues he donned over the summer. 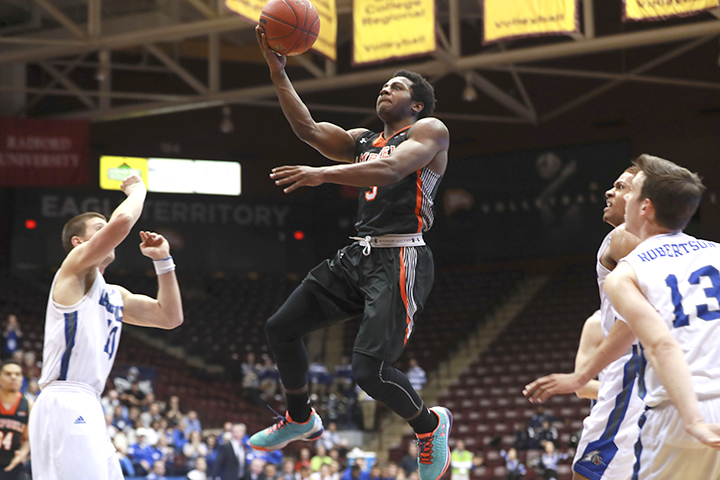 This means Clemons, who tested the NBA Draft waters with workouts for the Nuggets and the Boston Celtics, chose to return to Campbell for his junior season after igniting improbable Big South and CollegeInsider.com tournament runs to end the 2016-17 season as the nation’s third-leading scorer. The decision appears to have been a good one for both Clemons and the Camels. The Raleigh native averaged 24.7 points per game (a smidge higher than his 24.5 from a year ago), good enough to rank fourth in the nation despite missing three games to a lower leg injury in November. He is the leading scorer for a Camels team that finished the regular season 16-14, the program’s first winning record heading into tournament play since 2012. (The Camels begin Big South Tournament play tonight against Liberty as the No. 4 seed). Clemons’ season began with a 39-point outburst in the season opener — an 86-75 loss that was much closer than the final score — the most points ever scored by an opponent in the Nittany Lions’ arena. Other big games included a 33-point effort in a win against last year’s Big South Tournament champion Winthrop and 42 points against Liberty in January in a game that saw him and teammate Marcus Burk become the first duo in NCAA mens’ basketball history to each hit 10 three-pointers in a single game. The big season is showing NBA scouts that his sophomore year wasn’t just a flash in the pan. First, let’s go back a year. The 2016-2017 regular season, overall, was a disappointment for the Camels heading into the Big South Tournament. With a 14-16 record and a 7-11 conference mark, the Camels were a low No. 7 seed when it hosted even-lower Presbyterian in what amounted to a first-round play-in game. 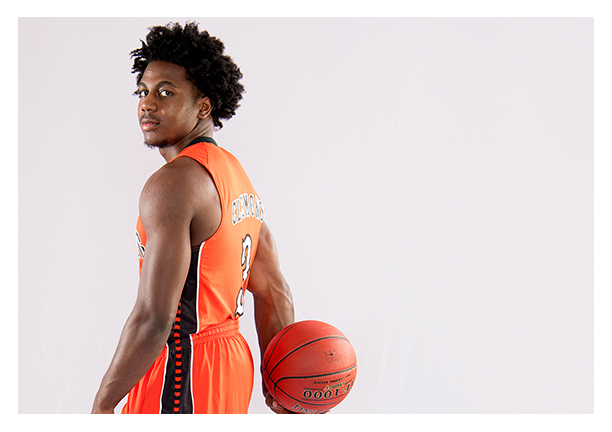 Campbell disposed of the Blue Hose easily, 81-62, behind Clemons’ 27 points. The “prize” for the win was a quarterfinal round match-up against No. 2-seed and heavily favored UNC-Asheville, which had beaten Campbell by 16 and 13 points, respectively, in the two previous meetings. The game, played at a neutral site in Rock Hill, South Carolina, was supposed to be the end of the line for the Camels. Fredette, the 2011 National Player of the Year out of BYU and subsequent NBA Lottery pick, was the only player in this century to score 50 in a conference tournament game before Clemons’ 51-point outburst in Campbell’s 81-79 upset of Asheville. Clemons’ big game was top news on ESPN’s Sportscenter that night, and college basketball fans around the country were suddenly intrigued by the 5-9 guard — sharing videos of his monster dunks from YouTube and comparing him to stars like Isaiah Thomas and Steph Curry. 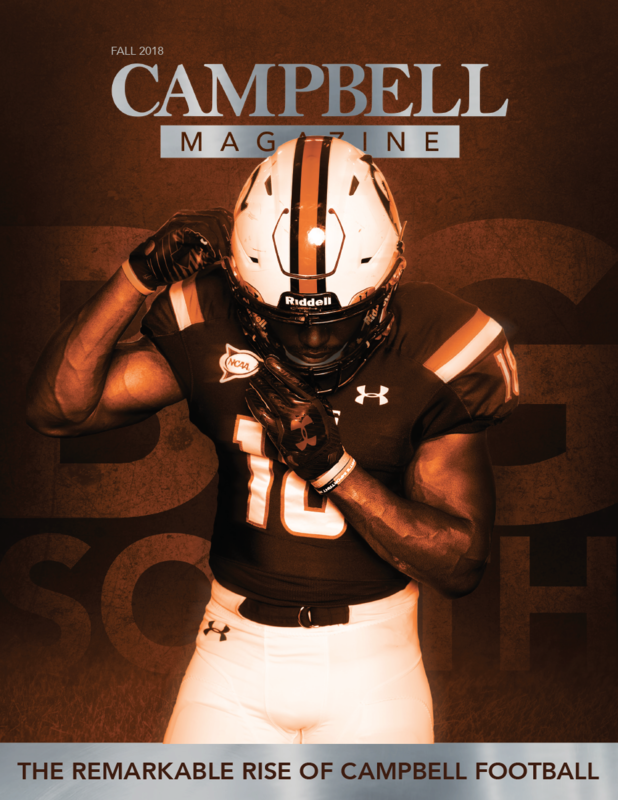 Clemons is low-key when recalling the game that’s defined his Campbell career up to now. They knew going in it would be a tough game, he says. They knew they had a shot to win if everybody executed, he says. He says he wasn’t aware that he topped 50 until after the game when he looked at the stat sheet. In fact, he says, he didn’t even think he was close to that. As for the notoriety that followed? 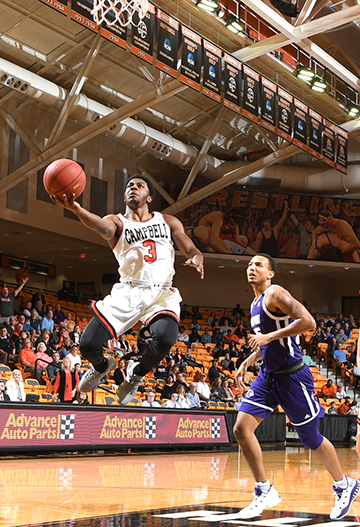 The win propelled Campbell to another upset the following day in the Big South Semis — a 66-50 win over Radford that put the Camels just a game away from their first trip to the NCAA Tournament in 25 years. But the magic ran out in the finals against Winthrop. Clemons scored 29 points in the 76-59 loss, but shot 9-for-27 from the field. The run, however, got Campbell noticed. The team was selected for the CollegeInsider.com Tournament a week later and won the first two rounds of that tournament against solid programs like Houston Baptist and Tennessee-Martin before falling in the third round against Furman. The Camels finished the season 19-18 overall, its first winning season under head coach Kevin McGeehan and its first winning season overall in five years. During his summer showcase, Clemons worked out for Boston Celtics General Manager and two-time NBA champion (as a player) Danny Ainge, who tagged the young man with descriptions like “skilled” and “a lot of potential” after their meeting. Those words meant the world to Clemons, and not just because of Ainge’s background and experience. Ainge was the man who brought Isaiah Thomas to Boston in a 2015 trade, a move that led to consecutive All-Star seasons for the shooting guard and a trip to the Eastern Conference Finals in 2017. The comparisons between Clemons and Thomas go well beyond their shared height of 5 feet, 9 inches. They share similar strengths, like excellent long- and mid-range shooting and the ability to power through bigger defenders. Both are bulky — Clemons is built more like a running back in football than a “sleek” guard in basketball. Neither were or are sure bets for the NBA Draft. Thomas was the 60th overall pick — the final pick of the 2011 NBA Draft — by the Sacramento Kings. He would finish his first season ranked seventh overall in NBA Rookie of the Year voting. Stories like that drive and inspire Clemons, who’s still left off some of the “way-too-early” 2018 NBA Draft boards drummed up by national basketball writers. He has one very big supporter in Coach McGeehan, who says Clemons has taken what Ainge and other scouts have told him last summer and put that advice to good use this year. The Camels ended the 2017-18 regular season 16-14, not a huge improvement over last year, but an improvement. More importantly, there’s more optimism heading into the Big South Tournament. The losses this year have been the result of inexperience in closing games out, rather than being out-manned and out-played. The wins this year have been more decisive. And for a multiple-game stretch early in the season where Clemons either sat out or played minimally with a lower leg injury, young players like Burk, Andrew Eudy, Shane Whitfield and Corey Gensler stepped up with big scoring games — Burk with back-to-back 30-point games at one point. McGeehan says the one thing that will boost Clemons’ draft status this year will be winning. 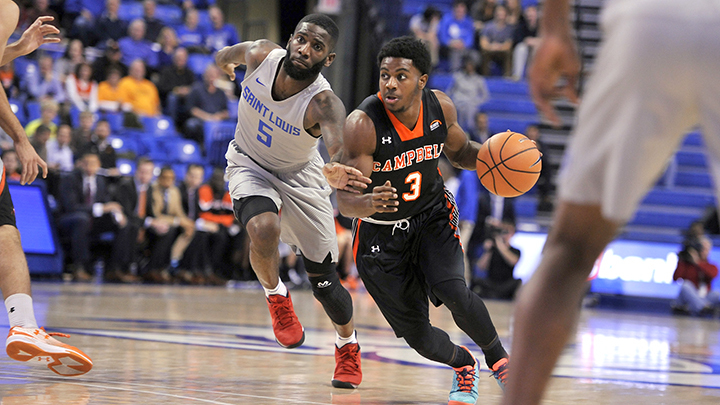 Should Campbell win the Big South Tournament — which wouldn’t be as much of a surprise this year — and make its first NCAA Tournament since 1992, the Camels would have at least one day on the national stage. And like the Asheville game, McGeehan is certain Clemons will make the most out of it.